The homestead and outbuildings at Nooitgedacht Wine Estate are surrounded by peaceful rolling lawns and centuries old oak trees, so it’s not surprising that the original wine cellar – that dates back to 1774 – is a favourite venue for weddings. With its historic charm, the rustic yet spacious building is a wonderful setting for functions and celebrations. 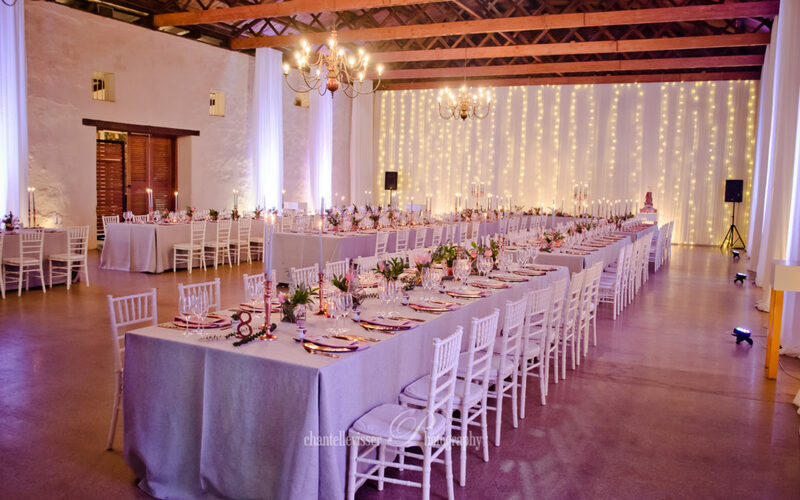 On behalf of splendid wedding planners and decor stylists, Trunk Events, The Events Draping Co. team was at Nooitgedacht to drape the walls in a series of graceful drops of white fabric that fell from ceiling to floor. Behind the main table a bridal backdrop in white was draped, featuring a city of fairy lights. Gorgeous photos by Chantelle Visser Photography.